We’d love your help. Let us know what’s wrong with this preview of Fire Starter by David J. Normoyle. I definitely didn't start the fire. However, I've been accused by the orphaned children of the couple who died in the inferno, and I have to clear my name. My memory of that night is fuzzy. I don't believe in magic or the supernatural, but what happened defies normal explanation. Whatever I discover, nothing will be the same again. To ask other readers questions about Fire Starter, please sign up. This is a prequel novella to an ebook series, and if I'm honest the whole fire starter thing is completely over done. Stephen King has written the famous Fire Starter book, I've read Mortal Ghost which is another fire starter (but with a different spin on it) and now we've got this. I legitimately like the idea behind this world in this ebook, but it's very over done. See the Cursed review I did and you'll get an idea of what this world is like. Throw in a corrupt cop and you've pretty much got This is a prequel novella to an ebook series, and if I'm honest the whole fire starter thing is completely over done. Stephen King has written the famous Fire Starter book, I've read Mortal Ghost which is another fire starter (but with a different spin on it) and now we've got this. Very interesting prequel, with enough action to keep you turning pages. There are plenty of twists and turns leading to big surprises in this short story. Some of them are scary but there is humor as well. Disclaimer: I received this book at no charge in exchange for an honest review. Really enjoyed this book (not going to go into the storyline) - it was little odd to begin with, but not having read this author before, figured would give it more than my usual first few pages, and am really glad I did. Good pace all the way through, although did jump a little bit, but that didn't detract from the story.......likely to look at others in the series too. I don't quite know how to review this novella. I received a copy through InstaFreebie via the author and it's in a genre that I don't normally read - urban fantasy. The story was well written and engaging and was set up to introduce you to the characters in The Sentinel series. However it didn't engage me quite enough to read more books in the series. I loved the book. I felt sorry for Rune because he could not remember and then to discover what he did. I am going to try my best to get Fire sorcerer because I cannot wait to see what happens. 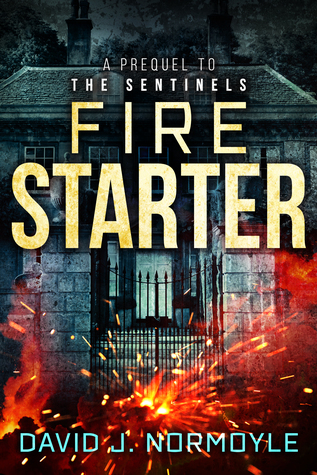 Fire Starter is the prequel to The Sentinels series. I was lucky enough to get a copy because I subscribed to David J. Normoyle's newsletter. Following what seems to be the standard style for most prequels these days, Fire Starter is a novella. Not complaining, just making an observation. The upside of this is that it gives the reader a bite size taste of the writers style. Generally they are cheaper than a full size book. Also since it's shorter readers don't have to commit as much time to read Fire Starter is the prequel to The Sentinels series. I was lucky enough to get a copy because I subscribed to David J. Normoyle's newsletter. Following what seems to be the standard style for most prequels these days, Fire Starter is a novella. Not complaining, just making an observation. The upside of this is that it gives the reader a bite size taste of the writers style. Generally they are cheaper than a full size book. Also since it's shorter readers don't have to commit as much time to reading it. So IF they don't like the prequel they don't feel they haven't wasted too much time or resources. All benefits to the reader. The downside is that since they are shorter the author really needs to pack a lot of punch in a little package. Definitely a risk for the author. Fortunately for me AND the author, Normoyle definitely succeeded with this prequel. Fire Starter drew me in and kept me there. I liked the characters that were introduced. I felt that I was able to get to know them in the short time we were together. I also got a view of the world the author has created in the Sentinel series. It's definitely a place that I would like to see more of. By the end of the story I wanted to see what the future held for the MC, as well as the supporting characters. I also wanted to find out more about the world they are in. Especially the other supernaturals!! The Sentinels is definitely going on my wish list. Hopefully I'll be able to pick it up before months end. If you happen to have read it I'd love to hear your thoughts on it.